With more than 15 years of rendering service to the visually challenged, the Vision Companion of MIT adds yet another feather to the pride of this institution. Here are the excerpts of the interview with the team of Vision Companion. Who initiated vision companion and how was it started? Ms.Vidya, who was a then faculty of ECE department brought forth the idea of vision companion. Initially it was conducted in WiFi-trees with the help of faculty members. Then, it was carried out in various department conference halls and finally today it is being conducted at LHC ground floor classrooms 001,002 and 008. How do volunteers help the visually challenged with their academics ? 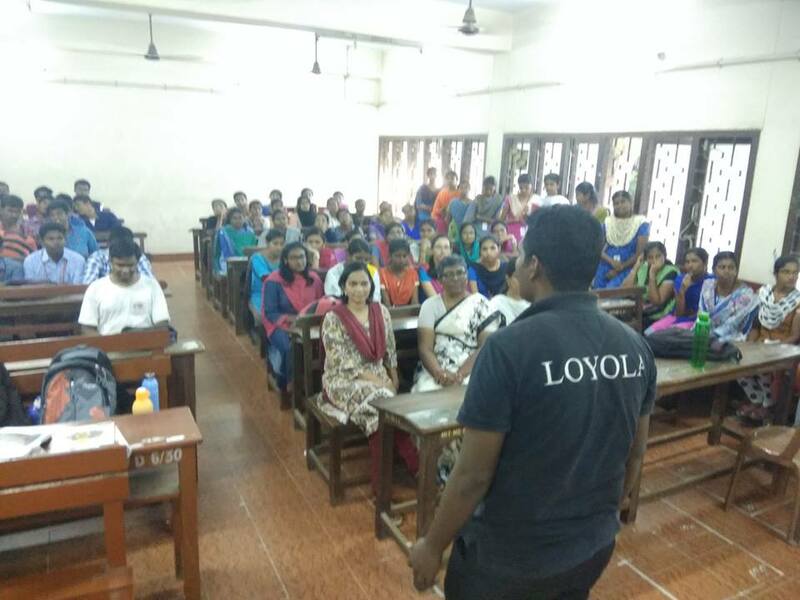 Students from colleges like Loyola , Nandanam, Queen Mary’s and MCC come to Vision companion regularly. All their academic works like assignment writing, reading lessons and recording them for their future reference are all done by the volunteers of our college. Sometimes activities are also conducted to help them finish their assignments. Other than college students many outsiders come here to complete their official and necessary work. What is the usual count of students for vision? Usually, there are around 10 males and one or two girls. All of them listen keenly to what we read and are very polite and interactive. They usually remember the names of all the students who help them and call them by their names whenever they hear their voice which is heartwarming and encouraging. Apart from academics , what are the other activities that are carried out by vision? People are coached for bank and other competitive exams. Our students go as scribes to help visually challenged people to write exams. At the end of the session, visually challenged people are given with a current affairs questionnaire in order to help them improve their general knowledge. From fetching water to quench the thirst of all the annas to dropping them at the railway station after 7:30 PM; everything is carried out by the students. What would you like to say about the volunteer participation of students? Though permission has been granted only for week-days the reading session has also been extended to weekends with some of the volunteers turning up to help them. Final years coordinate the entire session, while third years organize all the requirements and second years assist the visually challenged in reading and writing. First years are usually permitted to attend vision sessions only during the second semester. Tell us about the contribution of passed out seniors. They are the main pillars of the Vision companion till date. From re-charging the official mobile phone to buying stationery for writing assignments, seniors offer money wholeheartedly. Started fours years back, Youthfest is the annual celebration to encourage the visually challenged and to make them happy. It is usually organized and executed by interested volunteers from all the years. Various literary events and fun games are conducted in the morning session. And cultural programmes in the evening. Lunch is arranged in the hostel mess. This year it is to be conducted on the 10th of March. What are the achievements and recognition of vision companion ? Several people have been into bank sectors and have completed their UG, PG degrees with the help of vision. Mr.Rangarajan, secretary of blind association, has been a constant support for us over the past 10 years. Mr. Raghu studied with the help of vision and is now a professor in Nandanam college. MIT vision companion has been recognized as the best reading centre in Chennai. What Is your advice to all the juniors? Over the last two years there has been a constant decline in the number of active volunteers which is saddening. We’d really wish that the juniors carry on the 15 years legacy in the forthcoming years. All the students of MIT should experience the wonderful feeling of being part of vision at least once in these four years. As final years we have come across various kinds of volunteer involvement but this year marks the least attendance and we sincerely hope the situation changes. It is the prime duty of the second and third year students to ensure the active participation of the first years in vision companion. We sincerely hope for a change. Interviewed by AARTHI A K R, Second year, ECE and KARTHIKEYAN S, Second year, Automobile Engineering.